Before we talk specifics about RYZE.AI and how to make money trading currencies, lets discuss some Currency Trading or Forex basics. Forex is actually the short form of Foreign Exchange, which is also shortened even further to FX. Foreign exchange is simply the changing of one countries currency in another countries currency. For example, changing US Dollars into European Euros. Ever since the Bretton Woods Accords of 1971 currencies have been allowed to freely float against each other. That means supply and demand for the currencies in question drives the exchange rate. This also gave rise to the need for foreign exchange services. Commercial banks and investment banks began to offer these services, this also provided the speculative environment for trading one currency against another. Later this Forex trading became available online. Brokerages later developed a retail market open to individual investors, which thanks to the internet is widely available. Foreign exchange includes everything from the changing of currencies by a traveler at an airport currency exchange booth to billion dollar international payments made by corporations or governments for products and services purchased internationally in another currency. As globalization grown it has led to a huge increase in the number of foreign exchange transactions. The worldwide foreign exchange market is by far the largest financial market in the world, with average daily volumes in the trillions of dollars. Foreign exchange also refers to the global marketplace where currencies are traded virtually around-the-clock. In FX Trading, a currency pair is the quotation of a currency unit (For example, Euro) against the unit of another currency (For example, US Dollar). A currency exchange rate is always quoted in a currency pair, such as EUR/USD (Euro/U.S. Dollar). Currency pairs are written by concatenating the ISO currency codes (ISO 4217) of the base currency and the counter currency. One of the most widely traded currency pairs is the relation of the euro against the US dollar, designated as EURUSD. A quotation, ‘EURUSD 1.1500’ means that one euro is exchanged for 1.1500 US dollars. In this example, the EUR is the base currency and the USD is the counter currency. The most commonly traded currency pairs in the world are called the Majors. The major currencies are; the euro, the US dollar, the British Pound Sterling, the Canadian dollar, the Japanese yen, the Australian dollar, and the Swiss franc. Currency pairs that do not include the US dollar are called “cross rates”. A currency pair that contains the Euro is called a “euro cross”. Using an example where the Euro is the base currency, and it’s currency quote moves higher, it means the Euro has appreciated in value and the other currency has comparably lost value or weakened. In the previous example of the Euro and U.S. dollars, if the EURUSD quote increases to 116.00, then the Euro would be stronger since it is now able to buy more US dollars. FX trading often involves the simultaneous buying of one currency and selling of another. For example, when you buy a currency pair, you buy the base currency and sell the quote currency. It is key to understand the terminology. In FX trading, the “bid” is the price at which you can sell the base currency at the same time as buying the quote currency. The “ask” is the price at which you can buy the base currency at the same time of selling the quote currency. The bid price is always lower than the ask price. The difference between the bid and the ask price is known as the spread. 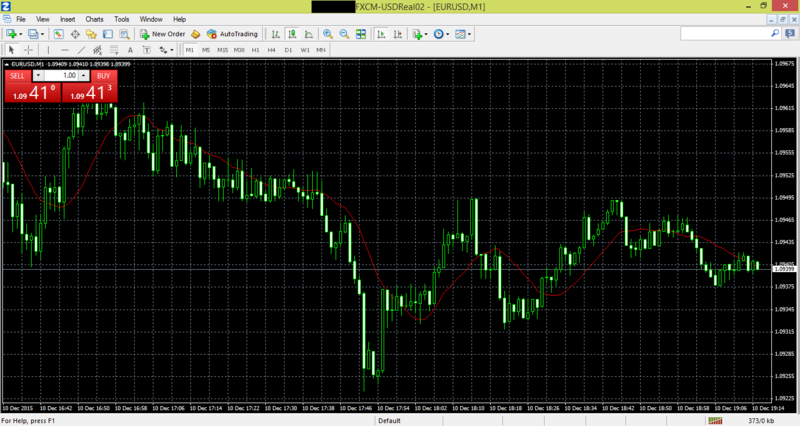 In the figure to the right for the EURUSD currency pair, the bid is 1.09402. This means market makers are offering to buy 1 Euro for 1.09402 US dollars. At the same time, the ask is 1.09408. This means market makers are offering to sell 1 Euro for 1.09408 US dollars. Think of it this way. If you buy, you buy at the ask or 1.09408. To break-even on this trade the Euro would have to appreciate by .00006 or 6/1000th of a cent to beak-even on the trade without factoring in commissions. 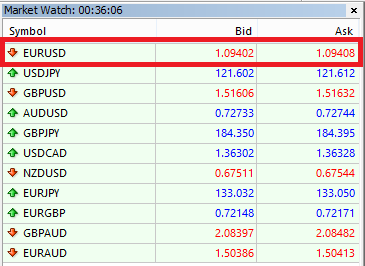 This is not much, if you look at the EURUSD 1 minute chart below (one bar each minute) that I captured from my account earlier today, you will see that prices usually have a range greater than this every minute. For the major currency pairs at least, the foreign exchange markets are highly efficient, that is the difference between the bid price and the ask price is very small. Again for the major pairs the Forex market is also highly liquid. This means that there are always buyers and sellers. Trillions of dollars are traded daily providing a very active market. 1. Liquidity: From the perspective of volume traded, the Forex markets are the largest in the world and as a result offer the greatest liquidity. This liquidity makes it easy to buy (enter) and sell (exit) a position in any of the major currencies within a fraction of a second. 2. Leverage: Because of the liquidity and ease with which a trade can be entered or exited, brokers offer large leverage for trading in the Forex market. This means that a person can trade large positions with relatively little money of their own. It is not uncommon for leverage to be as high as 100:1. It is imperative that a trader must understand the risks that leverage can entail as well. Leverage has to be used wisely and cautiously. Unwise use of leverage can easily wipe out a trader’s equity. 3. 24 Hours Trading: Forex markets off an advantage because of the fact that they trade 24 hours a day around the clock. Trading starts each day in Australia and ends in New York. The major Forex trading centers are Sydney, Hong Kong, Tokyo, Singapore, Frankfurt, Paris, London and New York. 4. Big Picture: Trading currencies in the Forex market is a “macroeconomic” undertaking. Forex traders need to have a macroeconomic or big picture understanding of the economies of the countries in question in order to grasp the factors that cause fluctuations in currency values. Example of macroeconomic factors for the USD. Microeconomics factors are less of a consideration than they are for stock trading. Trades generated by proven, experienced traders. Training and education to build knowledge and trading ability, whether you eventually choose to begin trading on your own or not. You control your account, your funds are not accessible by others.Initial minimum account size is low. Where can I Find All of These? RYZE.Ai is a completely automated system to allow you to participate and make money in the currency and commodity markets. It has a proven track record. Note: past performance does not guarantee future results. It also has a low account minimum of $500 for Hodo Global and RYZE.Ai members instead of the usual $250,000 minimum. Ready to to join us and start automated trading? click here. Need more information? Check out the overview video here. Have you ever considered creating a paid course about Forex? You seem to know your way around and I think you could create a very full packed course and maybe promote it here and/or on Udemy for example. I’m only saying this because I can see beginners understanding these concepts well from reading this post and others on your site. Also, thanks for mentioning Rize.Ai; I find it very interesting and I will create an account next week. I hope I can ask you a few questions in case I need a bit of help setting it up. I have not considered setting up a paid vourse on Forex. I post about my trafi g and hope that my posts are informative and entertaining but I do not view myself as sophisticated or knowledgeable enough to put together a paid course. I am flattered that you suggested it though. As far as setting up Ryze.ai account I would be glad to assist. I think you did a great job explaining the Forex market so that anyone can understand what it is. I wish I had a course on this while I was in school – I would probably be well on my way to be an expert by now. And who knows what could happen if schools did teach this and try to educate kids about money and how to invest it. Instead we focus on learning 90% things we will never use in real life and 10% things we might use sometimes. Sorry, for the rant, I appreciate your posts because they provide real value to anyone willing to learn. I am glad to hear that you find my posts educational. If more people understood the power of saving and investing and what happens with compound interest and how your money can really grow, more people would have financial security. My hope is that through educating people about opportunities like RYZE.Ai, I can help them to understand and take advantage of what is offered. I think the RYZE.Ai explanation and how it has no fee for smaller accounts is a good place for people to start. Please let me know any more thoughts you have and what your experience is after a few months of watching your account grow. great post on how to trade using the FX market. Thank you for your recommendation and introduction to RYZE.Ai. I was thinking to start up a trading account and the $500 minimin sounds perfect! Where do you think in what Country Currencies is the best place to get me start? Wow, this is amazing and a very interesting read. I did not know or even had an idea of how much money was involved in currency trading. This opened my eyes up for sure. I’m always looking for legitimate ways to make money in various ways. I’ll share this information on social media. I am glad I could make you aware of the enormous scale of the currency markets. Quite simple they are the largest market in the world with over $5.4 Trillion dollars traded every day. This market also trades 24 hours per day on weekdays. However, trading the currency markets on your own is not easy, in fact the large majority of people who try to do so lose money. Check out my posts on my experiences trading on my own. This is the reason I like RYZE.Ai from Hodo Global so much. It is a totally hands free trading algorithm that uses artificial intelligence to make trades. 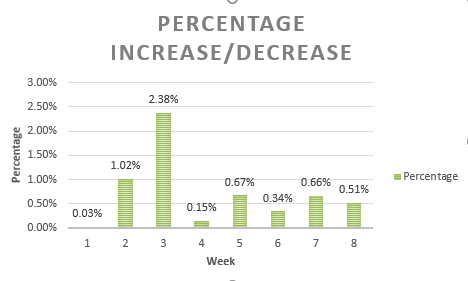 The results are excellent and it is consistently profitable and Hodo Global members can open accounts for as little as $500.. 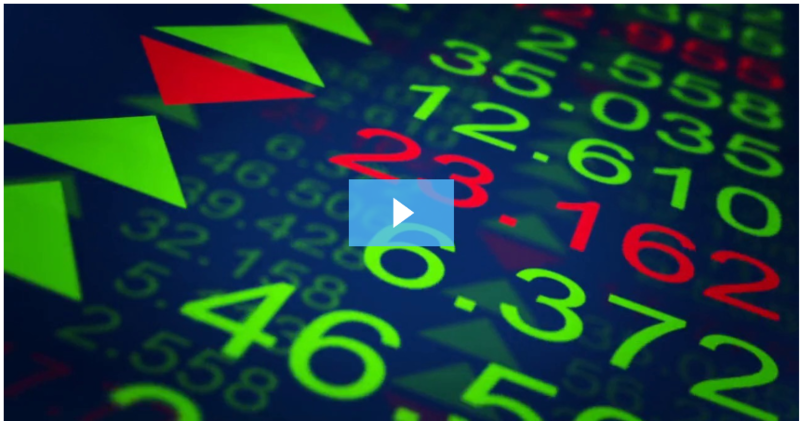 This is a great way for most people to participate in and profit from the currency markets. Check out my detailed post on RYZE.Ai or watch the videos here to learn more. There is also a webinar each Thursday evening that explains a lot about RYZE.Ai. Check out the link here. If you have any additional questions, please feel free to leave another comment or at xin@fxtradingincome.com.